Girl Scout cookies are my downfall. Seriously. I can’t pass their little table at the grocery store without stopping and buying a box or three. I bought them this year under the premise of using them for recipe development so I thought I’d better post one. 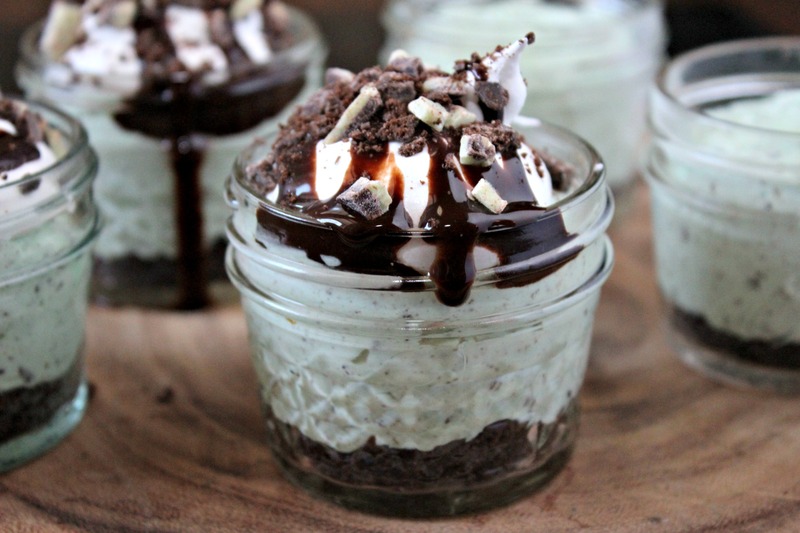 This is a take off of a Grasshopper pie using Thin Mints to bring out the mint flavor. 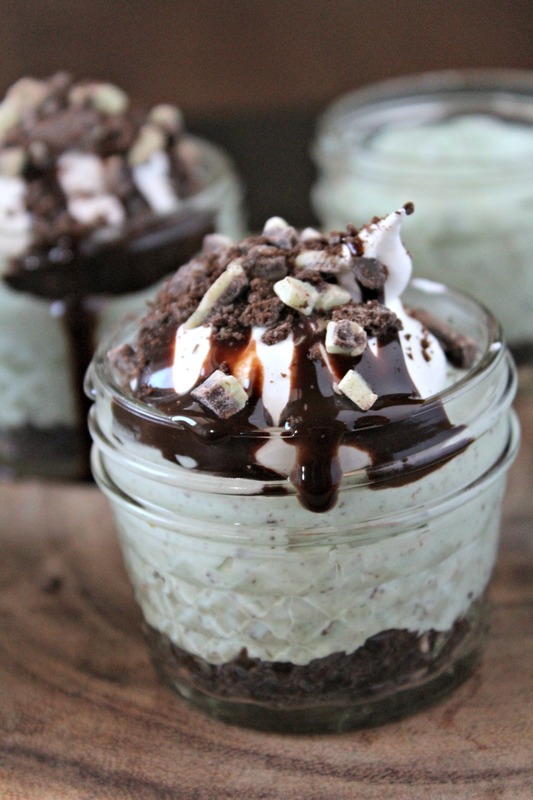 And anything tastes good in a mini mason jar! In a mixing bowl, add softened cream cheese and beat with an electric mixer and mix until creamy. Add sweetened condensed milk and continue to mix until incorporated. Add food coloring drops and continue to mix until you get your desired coloring. Place four of the cookies in a food processor. Pulse until finely crumbled. Add to cream mixture. 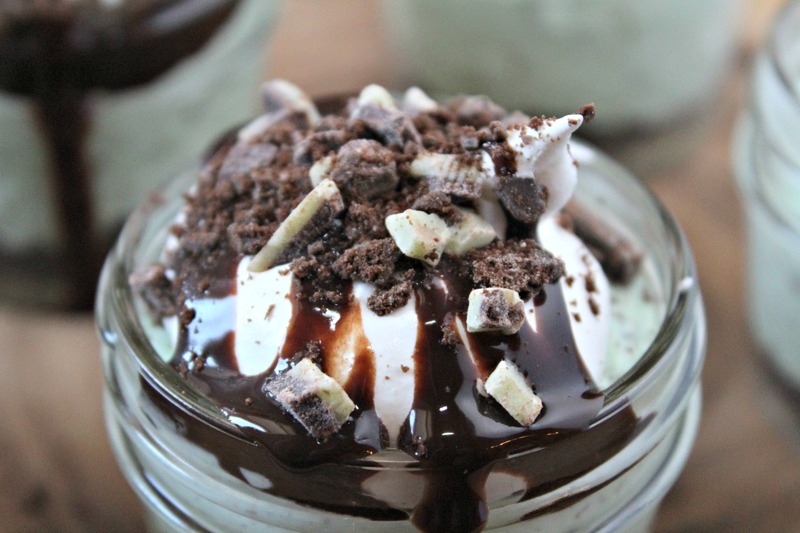 Add in 2 tablespoon of mint chocolate chips. Beat together to incorporate. Add in whipped topping and fold in to mix together. In the food processor, add the remaining cookies and pulse to crumble. Take out about a teaspoon to use on top of finished product. Drizzle in melted butter and pulse to combine. Divide the mixture evenly among five 4-oz mason jars. Press crumbs down to set. Evenly divide the cream mixture among the mason jars. Add the lids and seal tight. Place in the freezer overnight. Take out 30 minutes before serving. Top with a dollop of whipped topping. 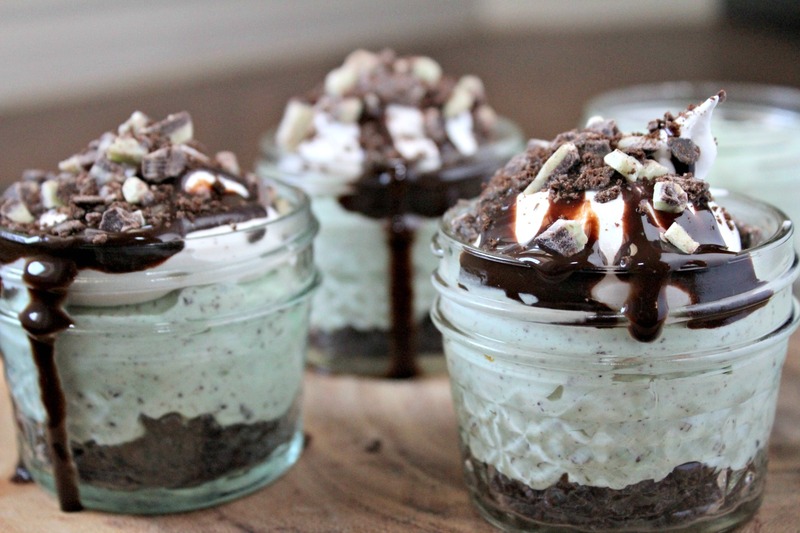 Drizzle with chocolate sauce and sprinkle chocolate chips and crumbled cookies on top.